When Tyrese Maxey commuted to Kentucky on May 9th, Big Blue nation knew they were getting a scoring guard with a versatile, pro-like offensive arsenal. What they may not have realized is the what UK head coach John Calipari and his staff realized long ago. He’s just as good on the other side of the ball. 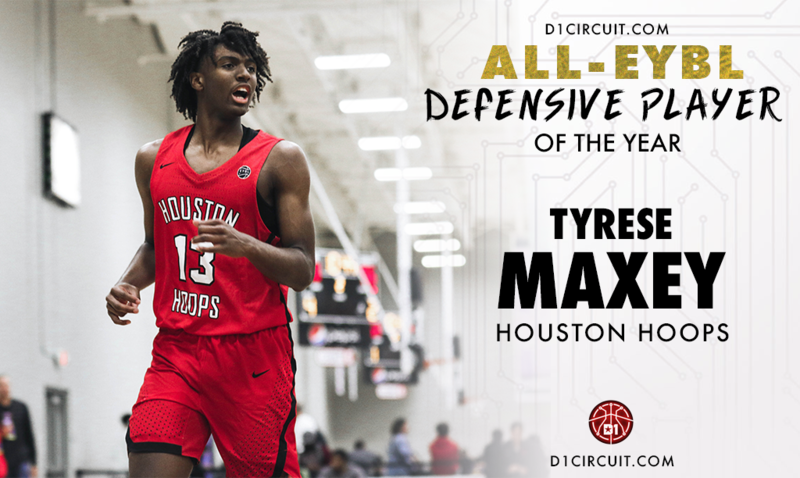 In 16 NIKE EYBL regular season games, Maxey was a complete ball-hawk, displaying elite on-ball defensive skills while leading Houston Hoops to 10 wins in 12 attempts. Playing three games with Drive Nation and the rest with Houston Hoops, Maxey set the tone on both ends of the floor, but his defense was something extra. He averaged 2.7 steals and over two deflections per game, wreaking havoc in transition alongside backcourt running mates and fellow Division 1 commits De’Vion Harmon (Oklahoma) and Chris Harris (Texas A&M). Hoops is fast, really fast. All three do their part, but Maxey is the conductor of the train. "It means a lot to win this award, because I feel like my defense is underrated." Off the court, Maxey has an extremely likable personality, and he translates his joy for basketball into an overall package amongst at the best in the nation. He’s coachable, plays for his teammates and implements a non-stop motor. Throw in some controlled athleticism and length, and Maxey is on another level at this stage of his career. Maxey is accustomed to doing exactly what Roberts stated - challenging himself. “I take pride in stopping the opposing team’s best player,” Maxey said confidently. Maxey’s offensive ability is arguably the best in the country amongst 2019 shooting guards, and that’s part of the reason why his defensive output is so staggering. Maxey exerts a massive amount of energy on offense, and somehow maintains his conditioning to match that effort on the defensive end. He simply doesn’t take plays off - it’s a trait that can’t be coached and one that separates Maxey from the pack. Elite two-way players are rare, and his presence on the floor at Peach Jam would make anyone an instant favorite, so expect Houston Hoops to play on Saturday night mid-July. He’s been wanting to prove his defensive acumen, and that’s what excites him most.